I’d had a rather intense blog post outlined for Friday, but I couldn’t even dive into it because I awoke to a thousand e-mails from y’all about how Beyonce surprised the world with a new CD, yadda yadda yadda, [insert praise], [insert YAAAAAAS]. what’s in your head, it doesn’t matter. 1) I think it’s important to notice the neighborhoods on the girls’ sashes – Inglewood, Oak Cliff, 3rd Ward, Shaolin, South Bronx, Bankhead, College Park – because many of these (all? I’ve only been to a few) are major minority communities. 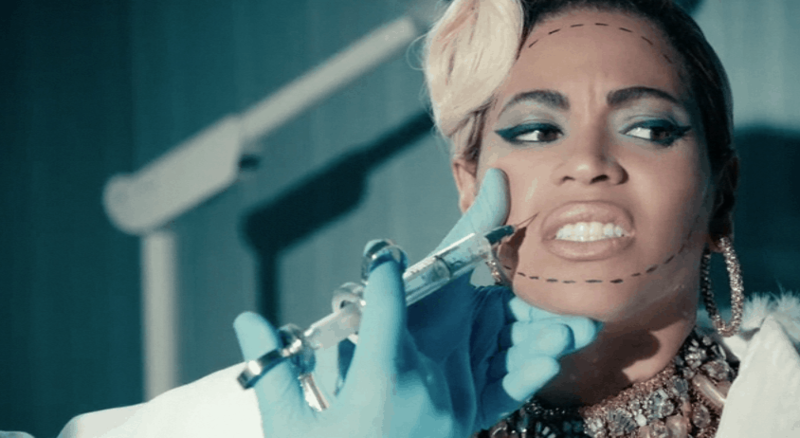 Much of the imagery surrounding the video has to do with diet culture, body shaming, and eating disorders (there’s a very graphic moment where Bey kneels before a toilet, a precursor to an earlier scene where she walks out of the bathroom stall, wiping her mouth; another girl is seen partaking of the cotton ball and orange juice diet.) So much of this tells me that the goal is to highlight how local the issue of poor body image and low self-esteem are among women just like us, in communities that aren’t the wealthy, upper class communities we generally tend to think of when it comes to these issues. It’s 2013: it’s downright deadly and dangerous to think of eating disorders and poor body image as “rich women’s” and “white women’s” diseases. 2) What’s more, I think it’s interesting that, with lyrics that decry TV and Vogue saying “thinner is better,” with pageant contestants who are from – for lack of a better term – the ‘hood, I think helps to drive home the point that yes, we’re still negatively affected by these images and messages even if the message isn’t directed at us. 3) The segment in the middle, where Harvey Keitel asks Beyonce what her aspirations are, and the only answer she can come up with is “to be happy,” made me terribly sad. It made me think of me. For a brief part of my own weight loss journey, I thought that shrinking down and “finally being able to fit into that Bebe skirt” would make me happy, but sooooo much changed over the course of even a year that I never expected. When you spend so much time focusing on fitting into what the outside world wants you to be, self-development and self-exploration go out the window. If your happiness becomes hinged on fitting into the mold, you never think about what happens when you fit the mold and are still unhappy. Of course you’re unhappy. You have very little idea who you are and what thrills you. It gives her singing at the end, repeating over and over “Are you happy with yourself?” a little more meaning. 5) There’s been a rash of videos lately that purport themselves to be some kind of critique on society, but the artist never puts themselves in the middle of it — oftentimes, they’re alongside the action, narrating it with their song. I think its interesting that Bey put herself in the middle of it all, suffering right along with the other contestants and their anxiety, fear, worry, and frustrations. 6) I think it’s telling, also, that in the end she still lost to someone who was “blonder” and “lighter” than her. I get the feeling that that wasn’t on accident, either. You can check out BEYONCÉ – Beyoncé yourself on iTunes and preview every song and video, right now. While my public commentary on this shall be limited (wink), I wanted to publicly say that this is an EXCELLENT post, Soror!! You have indeed made some excellent – and poignant – observations here. “Pretty Hurts” is my fave on this album for both its meaning, content, and the genuine-ness that I know lies beneath. Success in the entertainment industry is not free – nor CHEAP – and the local currency is often some part of your soul. So many personal and psychological settlements/sacrifices are made in the name of becoming great that the general public may not be as aware of. We see the success, beauty and seeming perfection but don’t know what goes into making artist “appear” that way. This “perfection” is supermarketed as the norm – or status quo and before you know it, has trickled down into our local communities of people who don’t have access to the machines than manufacture an artist’s/model’s celebrity’s “perfection”. As the lyrics state, “you can’t fix what you can’t see”. Its a poisonous phenomenon that can best be cured by someone who has experienced its effect first hand. I truly hope that people not just listen, but reflect on this song… and find the truth that lies beneath its lyrics. WHEW, that’s real talk right there. I need to pin that somewhere. You mentioned the sashes and how they reflect the ‘un-white’ (is that a word lol) America. Well I think she is showing how we, the minorities are faced with the whole white is right as well. We are told we are ‘fat’ for having curves. The models are all rail thin white girls. We are told our hair is nappy, we are sold to all that watch in the media that all black women are HIV positive, we all have babies. White is perfection. That is why she talks about the lighter the skin the blonder the hair. That’s why blacks are all on Instagram with posts that start ‘Dark-Skin niggas be like” “Light skin girls be like”…..I think she is showing how all those things affect what’s wrong with the black/ethnic races as well. Non-whites are only shown white girls, that’s why some black women get so upset when they see a black man with a white woman. They aren’t better than us. The tables have turned on the white girls now, they are feeling the pressure to have big butts, and curvier figures. I.E. the Lilly Allen video. The Kim K’s and Amber Roses of the world make white girls feel the pressure of having that black girl body. All women are faced with the challenges Beyonce highlights in some sort of way. Beyonce is a victim too. When you are on top, you have your everything picked apart. Is her hair long, is she mixed, what’s her diet. She thinks she is god’s gift. It’s a real shame. Great article, you got people talking and thinking. I thought this video was very telling and also interesting as the first. The album to me is a progression as in the first song she was very self conscious and did what she was told but by the end she was “A grown woman and I do what ever I want”. I agree that when I first saw it I was like Bey you do all of these things BUT never thought that this might be a something she is also struggling with. Such a good video! ps: But I loved the whole album and some of the videos made me like the songs more. It’s really book-ended with either side of the spectrum. And really, I have to say, I REALLY love the entire CD. I had to grow up faster than many of my counterparts because I had a daughter so young, but I feel like married, Mommy Bey is in some ways experiencing many of the same things that married, Mommy Me experiences, so the lyrics reflect some of my life. Uh, I don’t have a booty like hers [yet], but still. It really re-ignited my appreciation of and admiration for her. Yeeeeesssssaaahhhhh! That booty was out the whole album lol. She knew it was looking good too the way she was flaunting it. The thing I noticed the most about this whole album is how centered it is on Bey’s life (it even has home videos!) but I didn’t reflect on how that compares with, say, Lorde or Lily Allen’s recent “critiques” of pop culture. In any case, I’m sure people much more articulate than myself are out there writing better breakdowns on this comparison right now. It’s just amazing to see “Pretty Hurts,” a piece that actually successfully criticizes pop culture without tearing down women of color, fatness, or resorting to cissexism. Beyonce’s done it where so many others have failed. But what else is new? I was one of those that purchased Beyonce’s new album via I-tunes. I’ve listened to the songs over and over. Pretty hurts is one of my favorite songs. I must say after reading your post, I can now watch the video with more of an opened mind. Your post is amazing. I’m one that has been struggling with my weight for most of my life and I’m from “the hood.” Diet is one thing we do not talk about enough. Maybe she is a trophy – most men would love to have a woman who is literally drunk off their love and presence, but also? Bey is gorgeous. Something to think about? Sisters, I am a mature Woman and a Beyoncé fan. (Yes my Grand’s are surprised)The kids gave the CD/DVD set to us for Christmas. The first thing I wondered was would this start a national dialogue among Sisters, first and then all Women. I remember growing up and my Mom trying to get me into Beauty Pageants. I have Sister Friends that traveled that road. My Sister was in that world during her younger years into High School. I did not want any parts of it, because I was already body conscious and being compared to my friends. (Why wasn’t I like this friend or that one.) For me this was a pragmatic choice, because by the world’s standard of beauty I am not pretty or even beautiful. I aspired to be smart and athletic. These tools have served me well. I never wanted to be famous, I turned this life choice away. (I was a comic.) Now at over fifty I am well balanced and have a good life, not perfect, but GOD has Blessed me. This is my message to you younger Sisters/Women, put GOD first and make yourselves happy. You know, Love GOD and Love Yourself. This will help shield you from the harshness of this life. Once you think for yourself, make good choices, you will be Happy! Then, pretty will not hurt. Thank you for, first having this conversation and to Beyoncé for continue to address these events that adversely effect us as Sisters/Women.